"The Jacket" is the eighth episode of the NBC sitcom Seinfeld. The episode was the third episode for the show's second season. It was written by Larry David & Jerry Seinfeld and was directed by Tom Cherones. Jerry is shopping for clothes with Elaine, but struggles to find anything that he likes. As the store attendant goes to look around the back of the shop, Jerry finds an expensive suede jacket that fits and decides to buy it. Elaine reminds him that they are to meet her father, novelist Alton Benes (Lawrence Tierney), for dinner later that week. That evening, Jerry is watching television wearing the coat over his pajamas. Kramer comes in and likes the jacket, describing it as "more you than you've ever been." He is even more impressed when he discovers the price by reading the label. Kramer persuades Jerry to part with his old leather jacket as it will no longer be used. George arrives at the apartment with the song "Master of the House" from Les Misérables stuck in his head. Jerry tells George about a composer, Robert Schumann, who went mad because he had had one note stuck in his head for years. Now paranoid of his possible fate, George changes the subject to how nervous he will be around the famous author. Jerry shares the discomfort, saying Benes will be "...looking at us like he's backstage at a puppet show." As they are about to leave for dinner with Alton Benes, Jerry puts on his new jacket. George is very impressed: "This is huge! When did this happen?" he asks, "It's fabulous!" He then gets more and more shocked as Jerry refuses to deny that it cost more than four hundred, then five hundred, and even more than one thousand dollars.The price of the jacket is finally never revealed, all that is known is that it is more than $1000. Just as they are about to leave for dinner, Kramer comes in and asks for two minutes' help guarding his illegally parked car as he carries down some doves that he is looking after for a magician friend. However, they refuse to help as often Kramer underestimates how long things take to do. George is still singing "Master of the House" as they enter Alton Benes's hotel. Elaine has not arrived, so they sit down with her father and nervously order drinks. George orders his drink without ice, which prompts a shocked Alton to order extra with his. The conversation gradually gets more and more awkward, discussing how Elaine is sometimes punctual and sometimes not, the weather, and Alton tells Jerry how he reminds him of a "funny guy" he knew who was killed in the Korean War. "There's nothing funny about that", he tells an increasingly uncomfortable Jerry. Jerry makes his excuses and goes to the bathroom, abandoning George, who attempts to compliment Alton about his book. Alton describes it as drivel, and George does not help himself by stammering, "Well, maybe some parts!" George escapes and finds Jerry in the bathroom. Scrambling to find a way out of the situation, George suggests, "We'll say we're frightened and we have to go home!" "Yeah, that's good," replies Jerry. "He'll clunk our heads together like Moe." After returning to Alton, they discover Elaine will be held up for another half an hour. Thirty minutes later, Alton excuses himself and heads to the bathroom, just before Elaine finally arrives. Kramer had caught her and asked her to wait in his car for two minutes while he sorted out his doves, but twenty minutes later he had not come down and the car was towed, leaving her outside in the cold. She describes how Kramer eventually appeared out of the building with doves flying everywhere and causing her almost to get hit by a bus before she was forced to walk to the restaurant rather than have her promised lift. She asks Jerry how things are with them, and after a quick glance with George he assures her that things are "great, couldn't be better!" Alton arrives back and greets Elaine, and tells Jerry and "Chorus Boy" George that they are going to a Pakistani restaurant five blocks away. However, as they get to the door they realize it is snowing, and Jerry would have to walk through the snow with his suede jacket. At first, Jerry asks Alton if they can take a cab, but Alton replies that it is only a few blocks away. 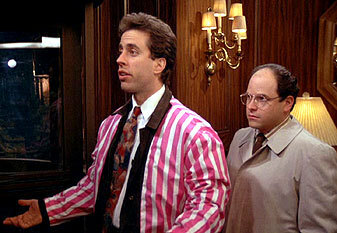 So then Jerry turns the jacket inside out but Alton tells him to turn it back, saying he looks "like a damn fool" because the jacket's bright pink, striped lining is now on display. The next day Kramer notices Jerry's jacket hanging in the bathroom, badly damaged by the snow. Kramer takes it, chiding Jerry for not turning it inside out. Elaine arrives, and tells Jerry that her father had a good time. She explains how he usually hates everyone but liked Jerry, as he reminded him of the funny guy from Korea. Meanwhile, in the car, Alton Benes finds himself singing Les Misérables' "Master of the House."